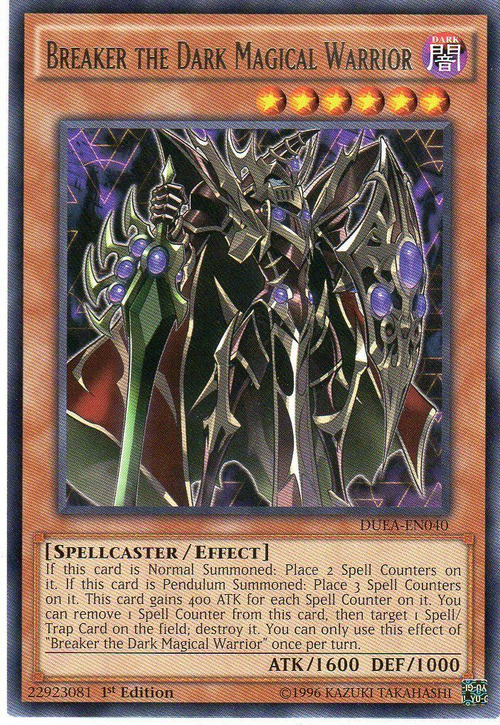 If this card is Normal Summoned: Place 2 Spell Counters on it. If this card is Pendulum Summoned: Place 3 Spell Counters on it. This card gains 400 ATK for each Spell Counter on it. You can remove 1 Spell Counter from this card, then target 1 Spell/Trap Card on the field; destroy it. You can only use this effect of "Breaker the Dark Magical Warrior" once per turn. 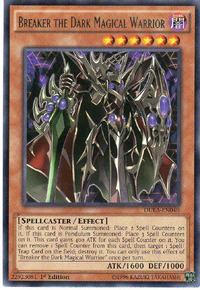 This card is an upgraded version of Breaker the Magical Warrior.